After cities across the United States, including Denver, set heat records in October, November has been just as balmy, prompting several ski areas in the Colorado Rockies to postpone their opening days and sparking debate over whether climate change is to blame. Schwartz, who was convincingly defeated by pro-coal industry U.S. Rep. Scott Tipton last week, championed a number of clean-energy bills during her eight years in the state legislature. She’s worried Donald Trump’s presidential administration will undo much of the progress made in combating climate change that she says is slowly killing the ski industry. Trump has called climate change a hoax perpetrated by the Chinese and threatened to unravel and outright rescind many federal air-quality regulations. 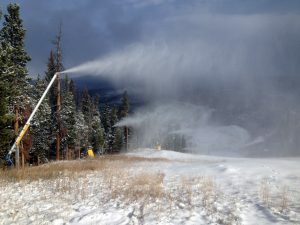 Snowmaking at Keystone, which finally opens Friday. Meanwhile, the ski industry — so dependent on cold weather and abundant snow — appears conflicted on the issue politically, giving to candidates on both side of the debate. And 2016 is on track to be the hottest year in human history, shattering the record set just last year.